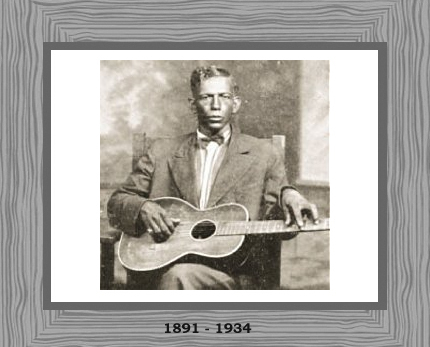 It would not be wrong to say that Charley Patton (also known as Charlie Patton) is, without any doubt, the only convenient source point of Delta country blues. The gruff and impassioned singing united with fluid guitar playing and the pounding beat made him the undisputed king of the Delta blues. Throughout the Mississippi Delta, Patton is recognized as a celebrity and a muse for aspiring musicians. Only five feet five inches tall and weighing mere 135 pounds, Charley Patton, with his gravelly and highly energized singing, was a “larger than life” figure who could sing in the loudest possible voice. It was rumoured that even without amplification, his voice could carry outdoors at a dance more than 500 yards. What made him so popular was his vaudeville-style vocal, combined with his whisky and cigarette laden accent, that sounded as if two people were talking to each other. Equally impressive was his talent to play the guitar with a propulsive beat and great rhythmic sense. Widely considered as one of the original artists who put blues into a strong, syncopated rhythm, Patton’s strident tone was reached by turning the guitar one step up and half above standard pitch. Patton was a popular figure invited to play at the plantation dances, juke joints and other celebrations. The emotional impact that he had on his listeners was so much that workers left their work on plantations just to listen to him that even had him tossed out of plantations many a times. He was a perfect embodiment of a 20’s sport blues singer; rakish, raffish, easily provoked and downing huge quantities of food and drink with a beauty on each arm and a guitar by his side. His biggest hit, Pony Blues, got so popular that it could be heard on phonographs throughout the South. He became one of the most popular Delta bluesman even though he was not the first one. It would not be wrong to say that by Mississippi standards, Charley Patton was a genuine star and celebrity. Whether it was composing music on the instruments or using different themes as background accompaniment in a single song, playing with a bass pipe or beating his guitar like a drum, he could do all with a flourish and create excitement and rhythm with just his style of playing. The technique of popping bass string was developed by him that was later reintroduced by funk bass players 40 years later. Patton’s talent of entertaining the crowd was perhaps another reason he was so popular. Southerners love music and entertainment and Patton provided them all being a masterful entertainer. His prowess to entertain the masses and involving them in his performance made him a real hero. His music consisted of a wide range of genres from blues to ballads, ragtime to gospel and much more. He was gifted with the talent to lend a barrelhouse frolic to complete stop by just singing religious hymns and kept the audience enthralled. Patton’s music is deeply rooted in 20’s black dance music and even when it comes to religious tunes in his stock; it is fuelled with a strong rhythmic pulse. It was in 1929 that he first recorded for Paramount and from that, there was no looking back. Within a year, he was the largest sselling blues artist, along with being the most talented one. However, of all his recorded songs, only 60 odd tracks are left as most of the original tracks were sold or scrapped when the music company went bankrupt. His last recording session took place only months before he died in 1934. Whatever is left of his music, it has a special place in history as it provides a glimpse into the history of Delta blues and the great singer that it ever produced.